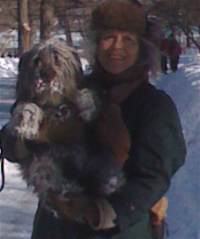 Most of you know my dog from his occasional appearances on this blog. You may know him as the neighborhood rat catcher, as a tireless explorer of urban nature, as the unwitting subject of my research, and as a supremely patient model. Some of you may even remember the first time he impersonated the great Norwegian playwright Henrik Ibsen. 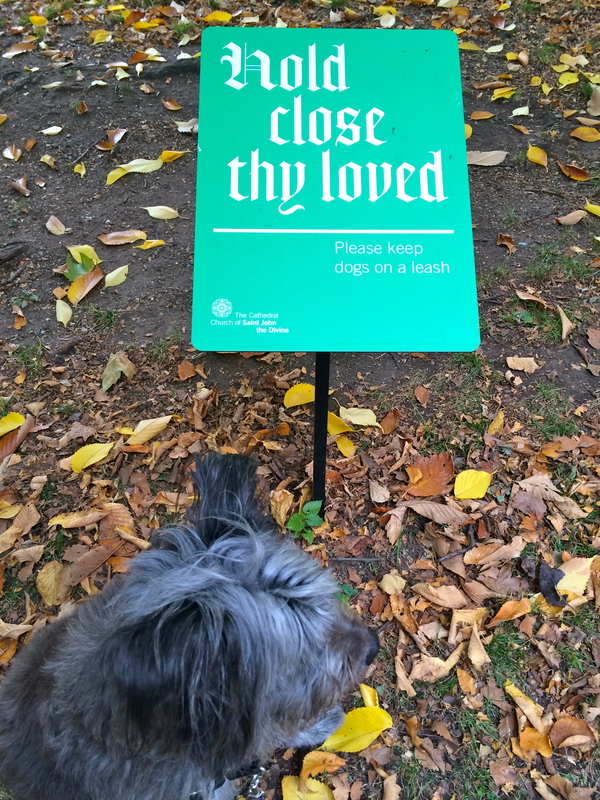 But what you don’t know – I myself only found out last week, when I took the photo below – is that for his own mysterious reasons (ah, who can fathom the mind of such a dog? ), Strider, aka Esau, has been secretly perfecting his Ibsen impression. Some deaths make waves. They’re noticed, written about, talked about, mourned. Other deaths, not so much. 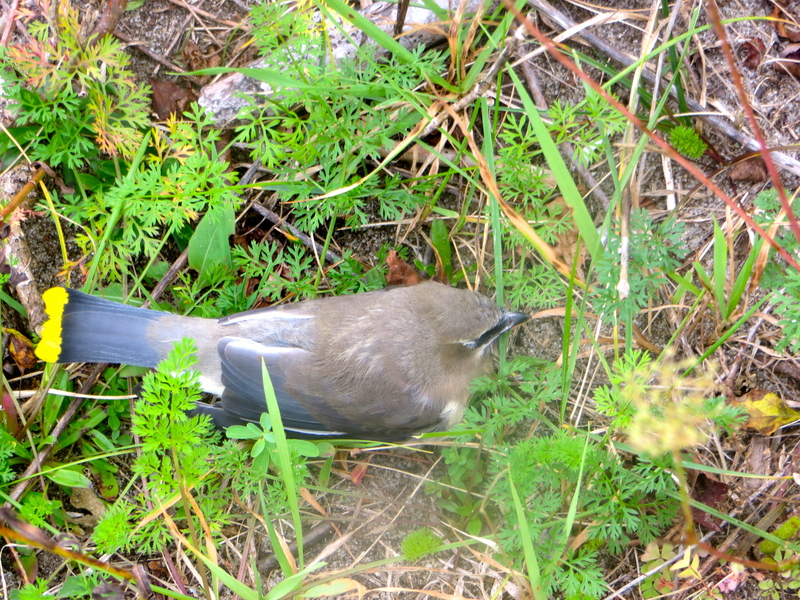 Yesterday morning, I noticed a bird lying in the grass just a few feet from the back deck. 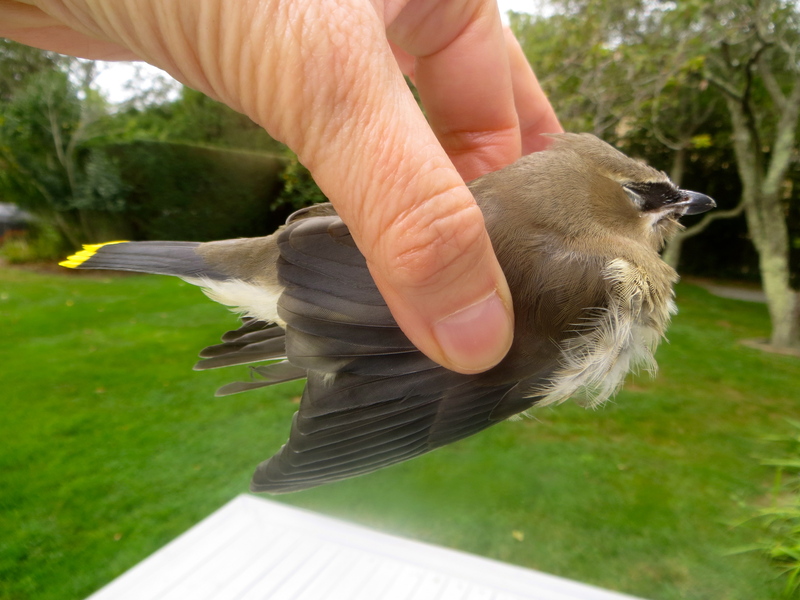 It was a Cedar Waxwing, as the brilliant yellow tail tips and the crest made clear. I thought it might be stunned, so I kept my distance so as not to frighten it further. 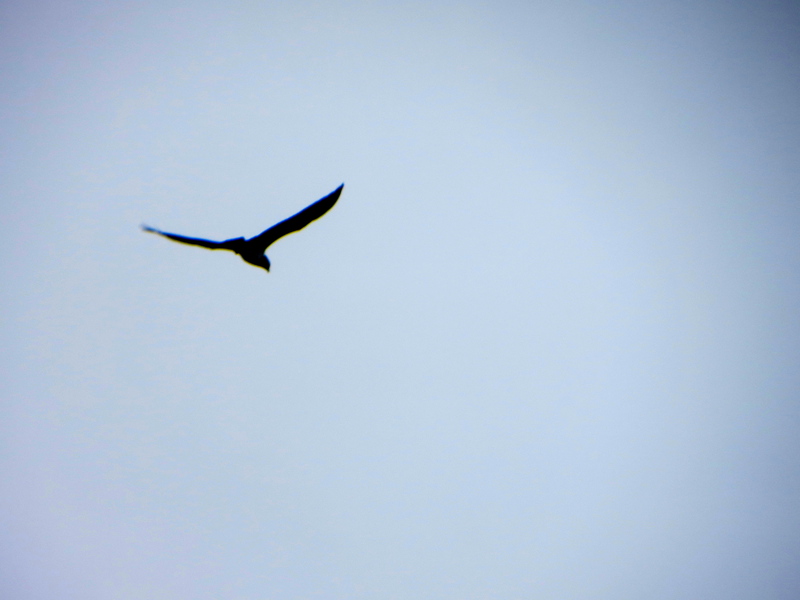 But I saw no flutter of feathers, no glitter of eye, no movement of breath. The little creature was dead. I lifted it and turned it over. There was no blood, but the feathers were disarrayed and perhaps damaged. Was this a result of sitting in dew-wet grass for hours? Or had the bird been hurt? 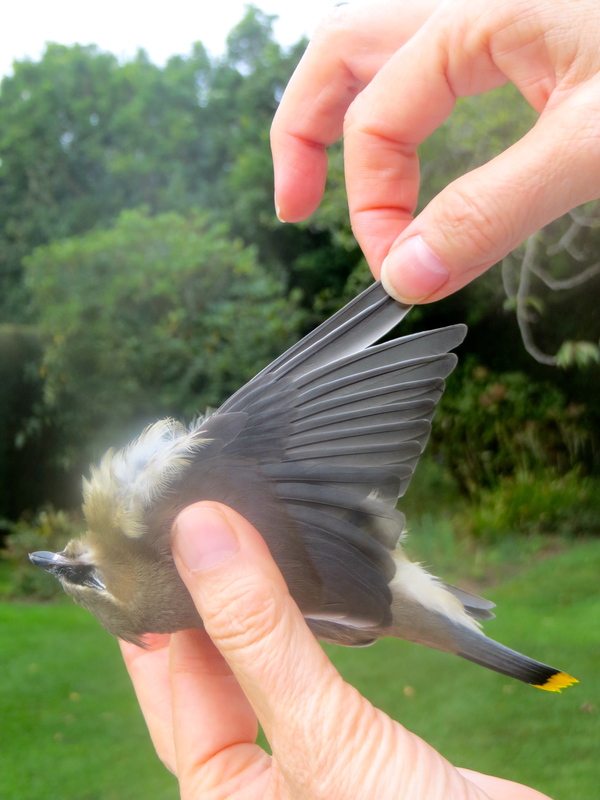 I was surprised at how heavy the little bird felt in my hand. 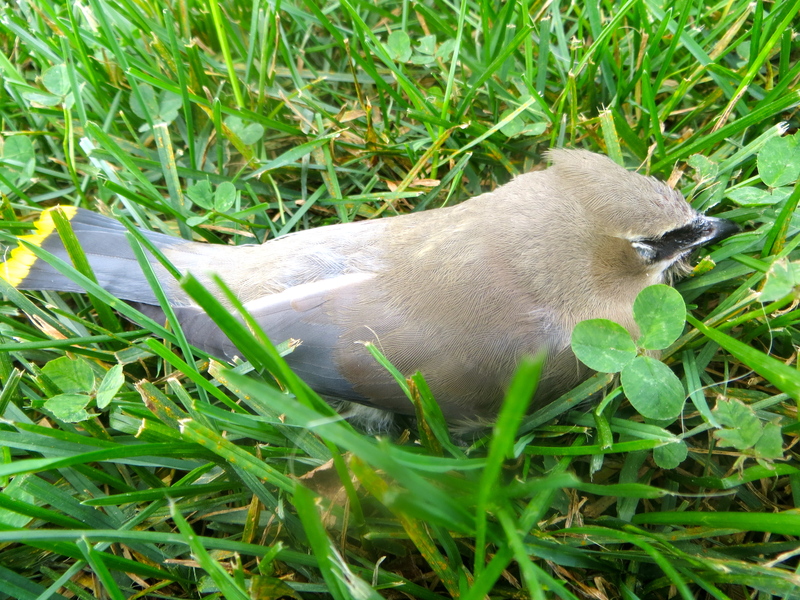 I wondered if the Cedar Waxwing was a juvenile. I saw only the faintest yellow on its underparts, and no sign of the bright, waxy-looking red wingtips that give the bird its common name. 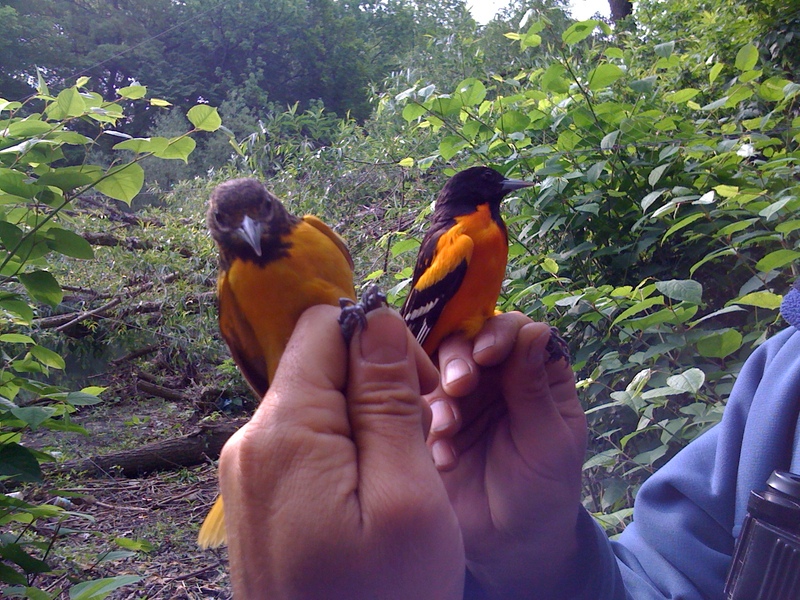 But Cornell Lab of Ornithology’s All About Birds maintains that the “red wax tips” are not always present. 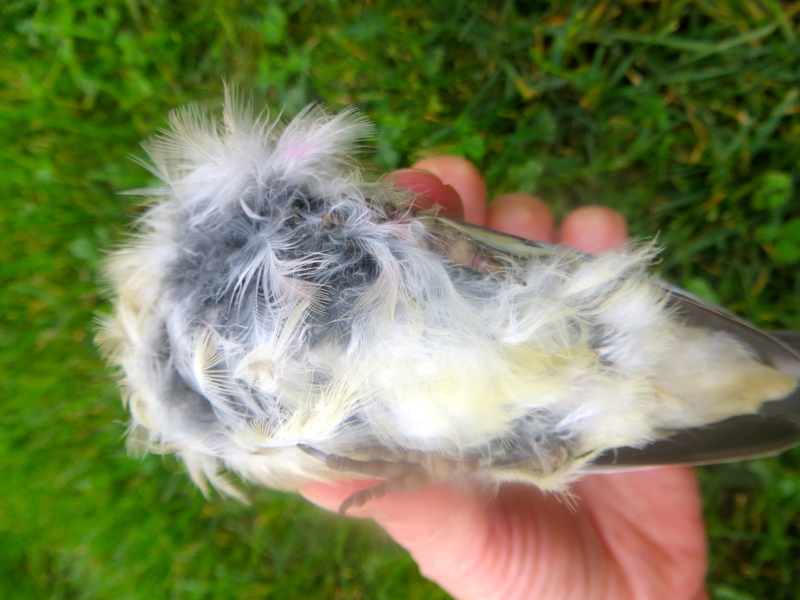 And the damage to the birds’ breast feathers may have destroyed the yellow of the under feathers. So I assume this was an adult. Whether male or female, I can’t say, since male and female waxwings are close to identical to an untrained eye like mine. 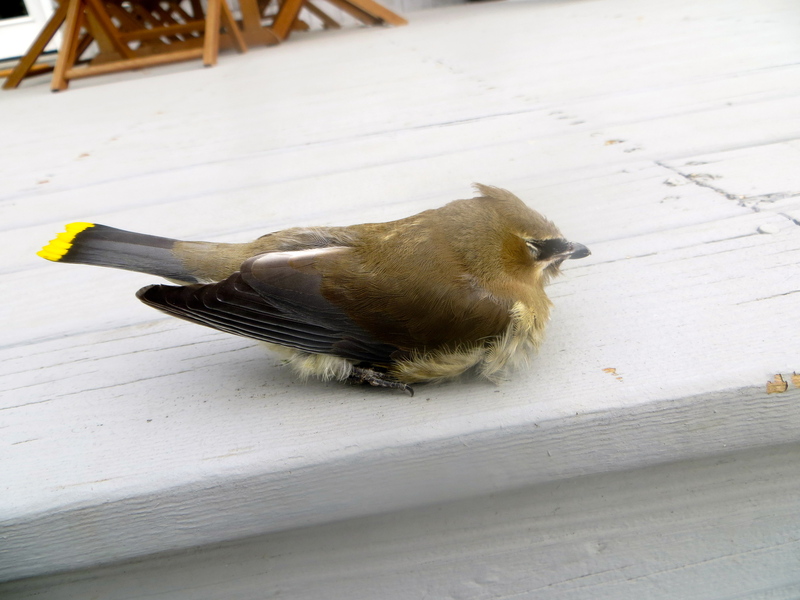 The bird looked peaceful in its oddly settled pose, even when I set it down for a moment on the picnic table. I wonder what happened to it. Did it escape from a cat, only to die later of internal injuries? Had it flown into something, and suffered injury? Or was it ill and could simply fly no further? I took it down to a scrubby patch by the bay, and left it there, thinking some scavenger would appreciate the morsel. A day later, it remained untouched. 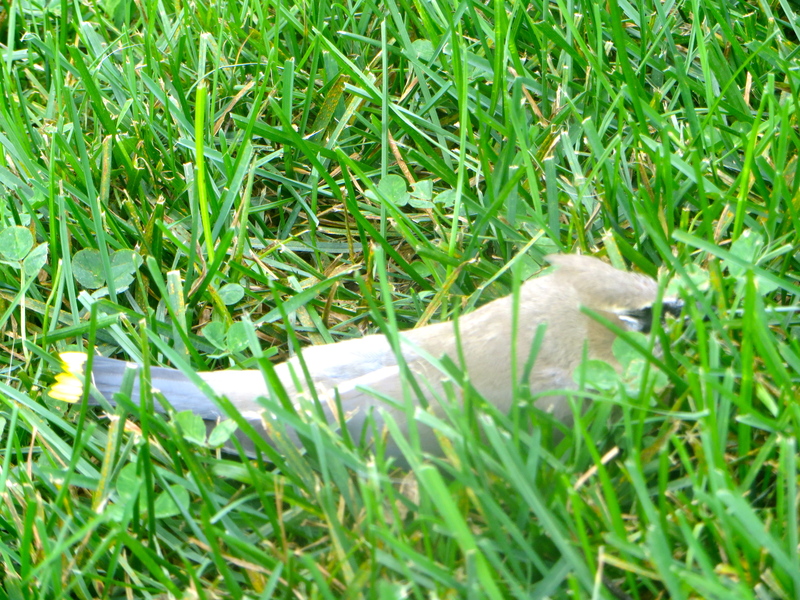 R.I.P., Cedar Waxwing and all small creatures at the end of their days. 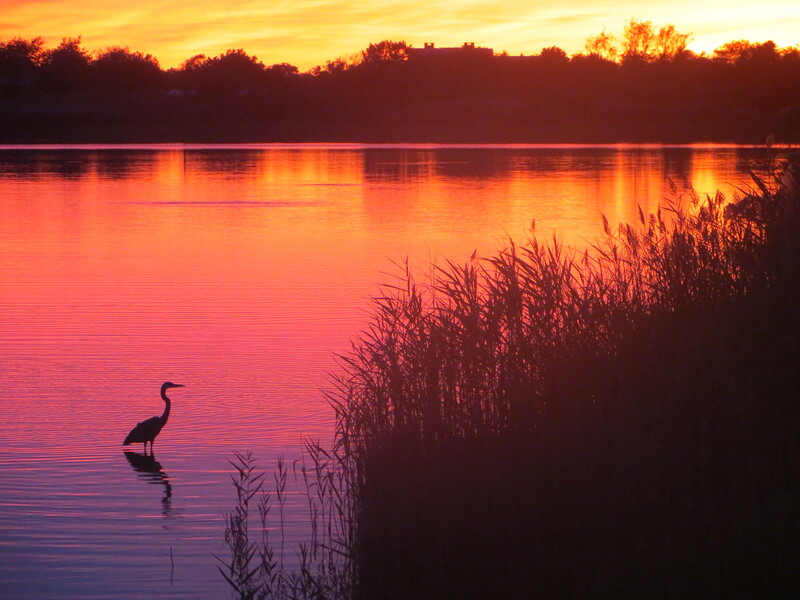 I’m out on eastern Long Island right now. 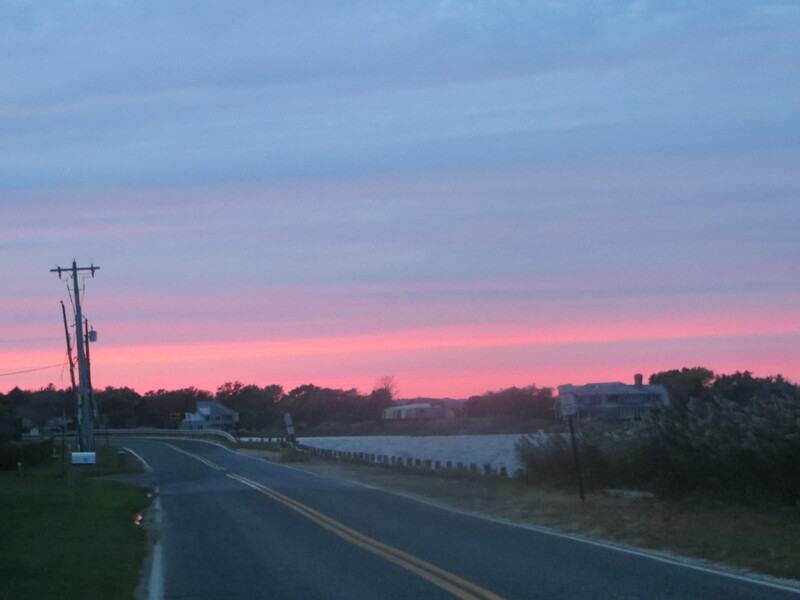 The landscape, despite the ever-proliferating McMansions, remains stunningly beautiful. Flying Point Road and Mecox Bay. 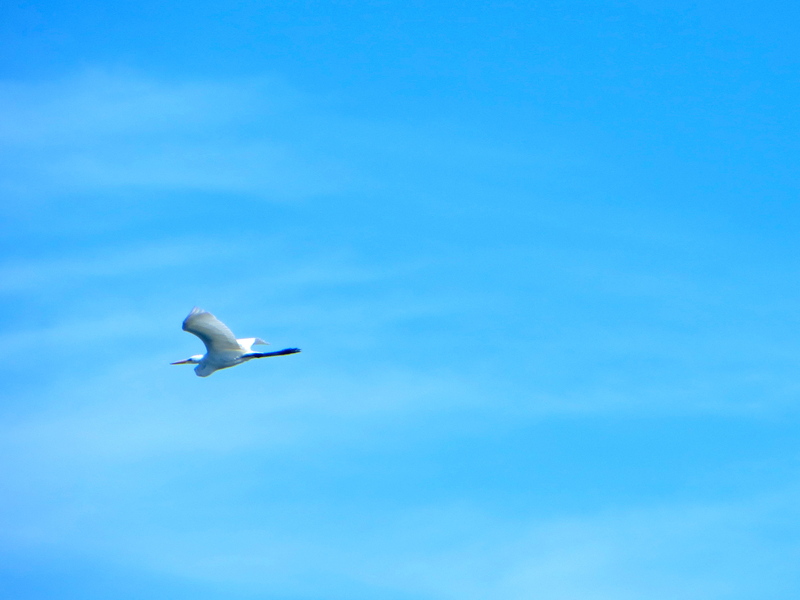 Great egret flies over Mecox Bay. 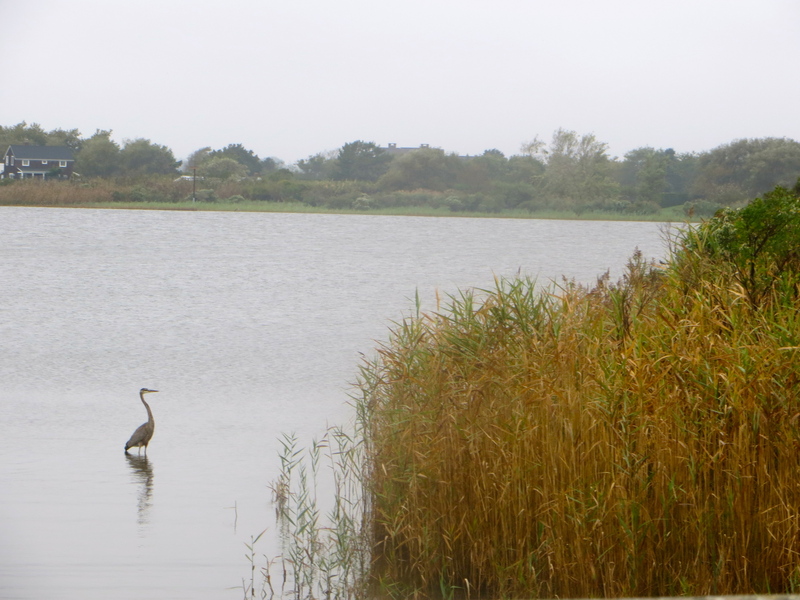 Great Blue Heron fishes in Mecox Bay. 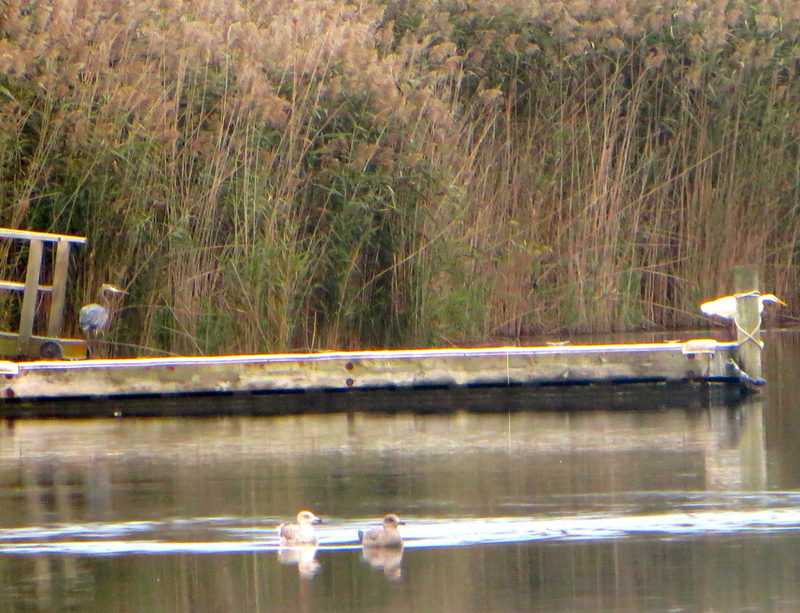 Usually the herons and egrets are loners. 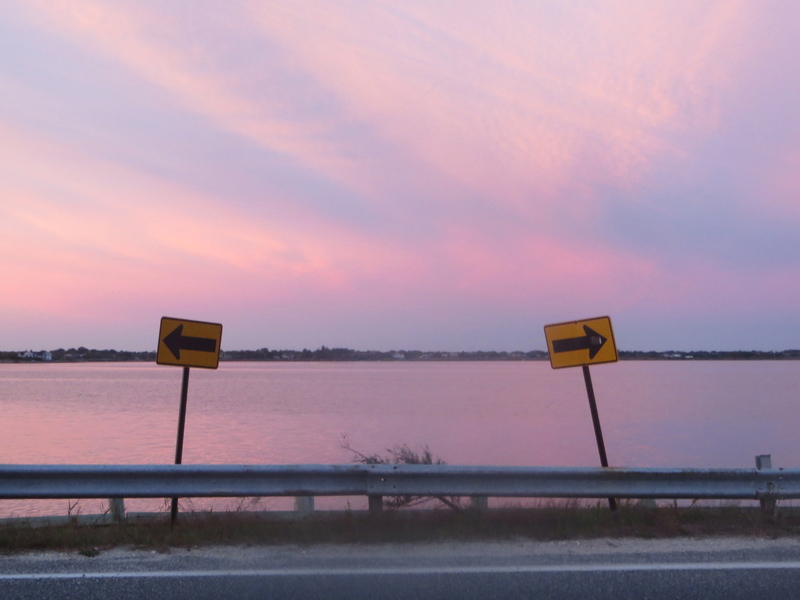 But sometimes they share a good fishing location. Great Blue Heron checks to see if the Great Egret is catching more fish. 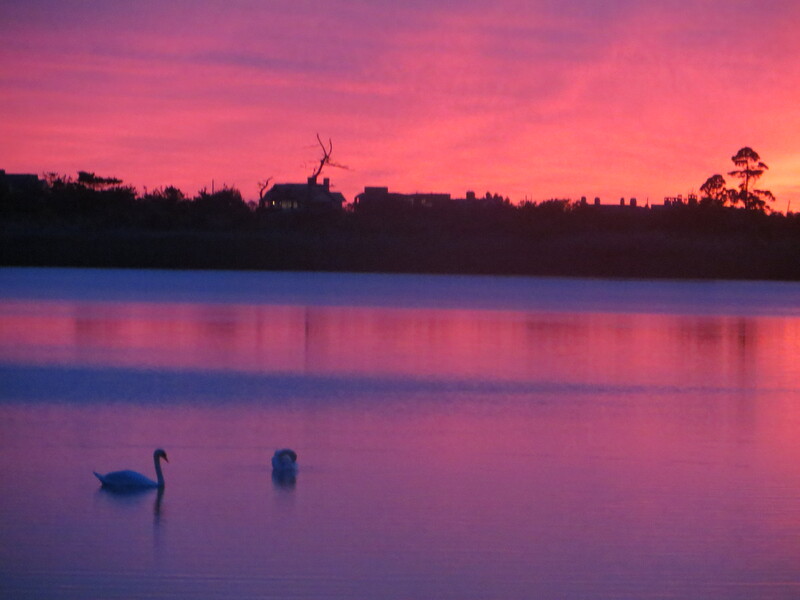 Many swans have flown away for the winter, but some still sail and dabble on Mill Pond and Mecox Bay. 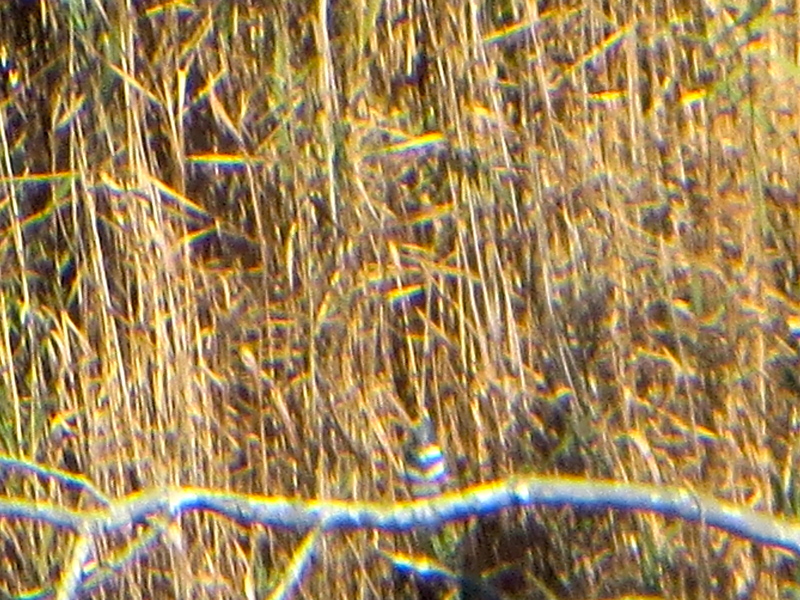 It’s always a pleasure to see the kingfisher (even if at too great a distance for a clear photo). So, yes, it’s beautiful out here. Just don’t come looking for direction. I had a great time making this three-minute movie of a falcon hunting a spectacular starling murmuration right in downtown Kansas City, Missouri. A murmuration is a massive gathering of starlings. There are so many birds flying they look sometimes like dark snow falling or a sky full of shooting stars. Other times the flock forms strange helix-like shapes, and it’s hard to believe it isn’t a giant organism with a single brain. One evening as I watched, a peregrine falcon swooped in, looking for dinner. If you enjoy The Falcon’s Lament, please share it with others. A peregrine is a usually an effective predator of birds on the wing. But in the on-going evolutionary offense-defense dance of predator and prey, the starling murmuration throws the falcon off and thwarts its ability to kill. Fascinating. And for some raw footage of the starlings gathering in downtown Kansas City, watch Murmuration of Starlings in Kansas City.